This is my first entry. I’m going to attempt to document our family travels. 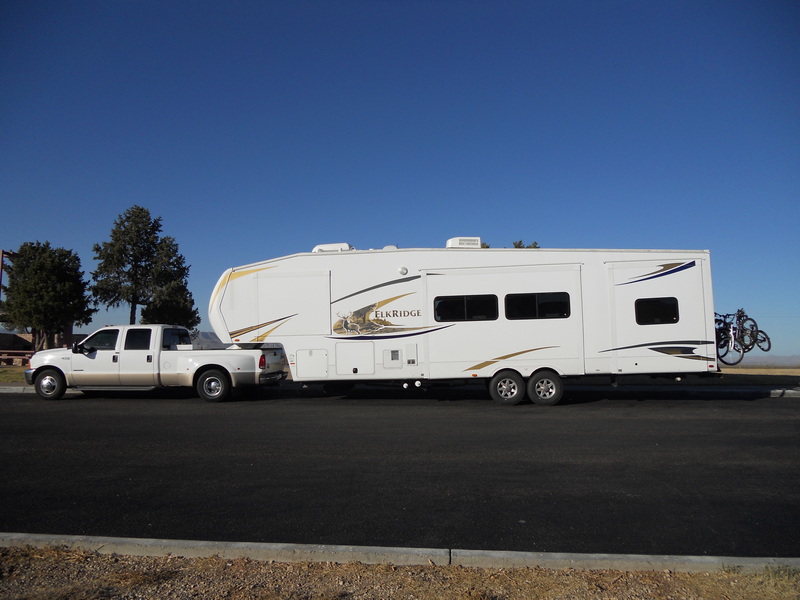 We just got a 38′ fifth wheel. It includes 1.5 bathrooms, a master bedroom, a bunkhouse that has two couches that turn into beds and two bunk beds above those. We’re pulling it with our new to us F350. It’s a 1999, 7.3l diesel, with an extra 100 gal tank gravity fed from the bed of the truck. My husband works offshore for 4 weeks at a time and is home for 2 weeks. We’re planning on using some of his off time to travel the nation. We homeschool, and so we have little to get in the way as we can just continue on learning as we’re traveling. While we’ve considered full timing, I doubt we will in the next few years. So, for now, just traveling when we can, to see this great nation of ours. This blog will be a way for me to share with several family and friends who do not live close the pictures and stories of our family. It will also serve as a type of logbook for myself and any others who may be traveling and need some advice. It will have info on campsites, restaurants, and routes; the good, the bad, and the ugly. I will attempt to separate and group these all together according to state. A bit more about us. My husband and I are late 20’s (he’s about to turn the big three-oh), and we have four children. Corbin-10, Gavin-9, Caelan-7, and Tristan-5 (at the time of this post). They have always been homeschooled. This is not some right wing, religious nut type of decision. I simply believe I can do a better job. I don’t believe homeschooling is for everyone, nor do I believe that everyone who chooses to public school ought to. I believe that for our current circumstances, I’m still the best teacher they could have. I will add that there are several nice perks to it as well, including certain religious and political points of view that we have as a family. It’s good to be able to talk freely about things in our classroom without fear of being politically correct and religiously inoffensive. I also like the freedom of having our days a bit less hectic, taking field trips during the days when everyone else is in school, and finishing up by 1 or 2 in the afternoon, with no homework. There are many perks to this lifestyle. There are also many responsibilities. My kids DO get on my nerves, and there are times I wonder if anything is getting through. I’m sure over time you will all hear me gripe from time to time. However, there are also many joys in seeing your children grow and learn. It’s nice to see my 9 and 10 year old be the only ones at a state capitol tour know the difference between a Republic and a Democracy and to know which one we are. It’s nice to test a 9 yo on spelling and have them testing in 6th grade. It’s good to see them ask questions about science and have them be able to spit it back out at the natural history museum to the amazement of the adults working there. We are about to launch Joe To Go. This will be a coffee shop business in which we only serve at events such as rodeos, fairs, festivals, etc. This business will be a traveling one, and we will be bringing our rig with us. At this point, I’m not sure whether I’ll just tag in a few entries here and there that have some interesting pics or info about the places we’ve gone, or if I”ll start an additional blog that is more work related. I think at this point I”ll be keeping everything together because the restaurants, campgrounds, pictures of our kids with us, and the probability of us stopping at different interesting places along the way is pretty high. And at this point, I”m just not sure if I”ll have enough info to support an entire other blog for just the business part of the trips.